Gwen Hicks has been volunteering with Susan G. Komen for more than 22 years. It all began when she learned about the Indianapolis Race for the Cure and longed for the same event in Terre Haute, where she lived. Gwen crossed her fingers and submitted an application with Susan G. Komen for a Terre Haute-based Race for the Cure. About six months later, the event got approved. “Not having any idea what would become a 21-year commitment, I pulled together the most amazing group of volunteers, and the rest is history,” she said. 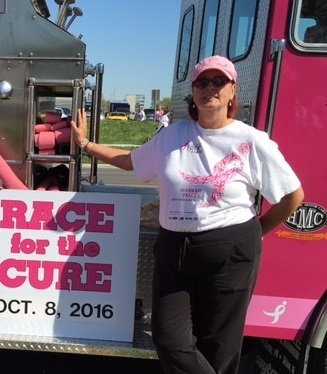 Besides taking on the role of founder of the Wabash Valley Race for the Cure, Gwen has played integral roles for Komen in the Wabash Valley, holding titles such as Race Chair, Merchandise Chair, Education Chair, Executive Director, and Mission Chair. She has also been a member of the Komen Central Indiana Board of Directors. Gwen has many fond memories from attending Komen events throughout the years, and loves getting the chance to connect with members of the community who have been affected by breast cancer. Some of her most memorable interactions include meeting women who couldn’t afford a mammogram, only to get one paid for by Komen, and meeting with Amish women with no information on breast cancer and educating them about breast health. Gwen has also been touched by the survivors she has encountered. “The courage, hope, and strength shown by those battling breast cancer inspires all of us to keep going,” she said. Gwen strongly believes in Komen and what volunteers are capable of accomplishing together, and commits herself to her favorite saying: “If your dreams don’t scare you, then they aren’t big enough.” She believes Komen embodies that mantra perfectly. Gwen’s legacy continues through the 2017 Wabash Valley Race for the Cure, which takes place on Saturday, October 7, 2017. Registration is now open! From the whole Komen Central Indiana family, thank you for your contributions! You truly make a difference. Interested in getting involved as a volunteer like Gwen? Learn more about opportunities and how to get started.